Squatting mechanics is not just about bending your knees and moving back up, in fact, there’s more to squatting than just a simple exercise. Doing it right can do wonders for your body, but do it wrong and it could do you more harm than good. Here are some helpful and practical tips to help you develop the right squatting process and free you from fear or worries of not doing it right. Use your hips when you do your squatting exercises and require more horizontal back angle for a maximum effect. It is always necessary to bend the hips and the knees as you descend the bar and it should be the hips that get the primary emphasis. This can be done by focusing on the back angle to facilitate movement that is dominant on the hips. By doing so, the load is focused on the hips by prolonging the moment arm on the back and hips and shortening the moment arm on the knees. This method transforms your squat exercises into a hip-dominant back routine that includes the legs. When you do squats, think firm and rigid, instead of vertical. When squatting with the hips, you need to understand that you use a horizontal back angle. This hip-drive method lets you assume the proper back angle and knee position for the bottom of the squat when you are about half-way down and holding the position as long as possible until you return back to the position on the way up. Place the toes out 30-35 degrees in order for all the lateral and medial hip muscles are involved in the movement and knees must be shoved out to make the thighs parallel to the feet. The hip flexion angle must be the same as the back angle to allow the spinal groups to remain neutral. The strong isometric contraction of the muscles that surround the spine keeps the back in the normal anatomical position, which is technically flat as this is when the muscular lower back assumes a flat position across the top of the muscles and holds a normal curve of the spine. This becomes an efficient force transmitter and a safe position to be loaded. The back and hips work together. As you do the squats, make sure that the back is locked tight and stay flat. The angle of the hip flexion must be equal to the back angle. Bend over enough to keep the back in the normal anatomical relationship with the pelvis. 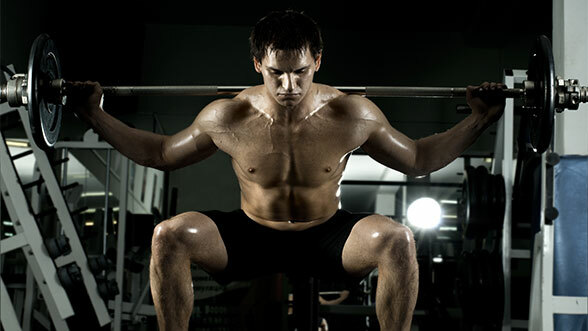 So take good note of these squatting mechanics to allow you to optimize your squat workouts. You can also get a boost from maintaining your healthful diet by keeping away from sugary treats and now you can have the best of both worlds with Promax Low Sugar Chocolate Fudge bar. It gives you the right amount of nutrition that you need to support your workout and at the same time, let you enjoy the bliss of biting into a food bar without the guilt. Packed with significant amounts of protein and fibre to help meet your nutritional needs and at the same time contains very low sugar.